Tropaeolum, or Nasturtium is a great flower for the beginning gardener. In fact, it does quite well with a little benign neglect. Its varieties grow in bushes, climbers and trailers. It can be used on a trellis, in an empty spot of a garden or hanging over in a flowerbox. Best of all, every part of the plant is edible. They are known for their fiercely brilliant colors,so bright that photographing them is difficult. Choose a site with full sun and good drainage. Sow Nasturtium seeds once the weather warms up, either in early spring or early summer depending on your location. Sow the seeds about 10 to 15 inches apart, and about 1 inch deep. Water immediately after planting. Then do not water for another 10 days. If you choose a climbing variety, make sure to provide a support for the plant and train it as it grows. Picking the flowers will make the plant bloom for a longer period of time, so pick away! The plant will bloom from early spring into the late autumn. Best of all, these annuals will reseed themselves. Water weekly, but do not feed the plant any fertilizer. Again, the variety is a matter of personal preference, as all the varieties of this species grow in the same conditions. If you like a bushy breed, you may want to look into the Alaska Series. These small, bushy plants have bright jewel-colored flowers that hold their necks above the foliage to avoid getting lost. If you are growing in a flowerbox, you may prefer Peach Melba, which will trail down over the box. A popular vine variety is Canary Creeper, which produces feathery, yellow blooms. These flowers go from seed to bloom very quickly. They're also great for kids who are just starting to garden: the taste of success could encourage a child into a life of gardening. Nasturtiums are a colorful addition to any garden space. Many varieties trail or climb. The plant's Latin name, Tropaeolum, comes from the shield or circular shape of the plant's large leaves. Nasturtiums are notable because the entire plant is edible as well as beautiful. They are useful in ornamental gardens, hanging containers, edible or herb gardens. Nasturtiums have a spicy, peppery flavor that surprises many when they first eat the plant. The original variety was first known as Nasturtium on account of its watercress-like taste. Both leaves and flowers may be used to add spice in salads, or as edible decorations on cakes. The yellow and orange flowers add an elegant garnish to any dish in cooking. Nasturtiums are easy to grow and prefer sunny or partly shaded locations. They prefer well-drained soil. Rich soil promotes leaf growth, while poorer soils produce more abundant flowers. In many regions with frost or snow, Zones 7 and below, nasturtiums can be grown as annuals. In Zones 8 and above, they may be grown outdoors as perennials, dying off in winter and producing new growth the following year. Nasturtiums may be prone to some viral diseases. Additionally, they may become invasive if allowed to take over a garden bed, due to their trailing habit. Nasturtiums may be good as companion plants in deterring pests. They are often used to deterring cucumber beetles, white fly and sometimes woolly aphids if grown at the base of apple trees. Nasturtiums can easily be grown by seed propagated in late spring or early summer. Outdoors, many will self-seed freely and take over large areas of soil. Trailing flowers are especially charming solutions to the narrow widths of railing planters. Choose nasturtiums or sweet peas for sunny decks, and impatiens for shadier situations. When space permits, pair these cascading beauties with sun-loving geraniums or shade-friendly violas or petunias. Plant nasturtiums in well-drained soil in full sun and provide them with approximately 1 inch of water a week. Properly tended, healthy plants are less susceptible to aphid infestations. Remove damaged, yellowed and sick nasturtiums from the bed. Weak plants attract aphids, and the aphids may spread from the sick plants to nearby healthy nasturtiums. Inspect the nasturtiums at least twice a week for signs of aphids, especially when temperatures are below 80 degrees Fahrenheit. Wash any aphids from the nasturtiums with a sharp spray of water from the hose. Weed the nasturtium bed and surrounding areas weekly to prevent any aphids from migrating from the weeds to the flower bed. Destroy the weeds or dispose of them. Prune away any badly infested leaves or stems from otherwise healthy nasturtiums. Dip the pruned foliage in soapy water to kill the aphids before composting it, so the aphids don't migrate from the compost pile to other healthy plants. Spray infested nasturtiums with a horticultural oil or insecticidal soap. Repeat the application every two to three days until the aphids are gone. Soak nasturtium seeds overnight in a bowl of lukewarm water to speed the germination process. Drain any excess water from the bowl and plant the seeds immediately. 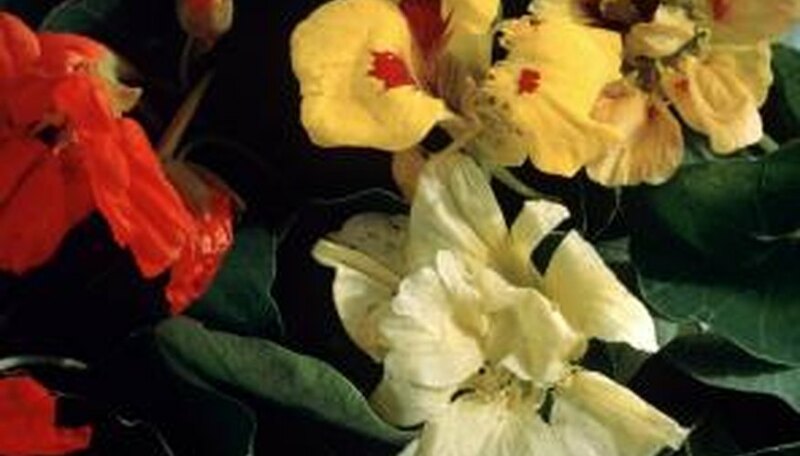 Sow nasturtium seeds to a depth of ½ inch and firm the soil down with your hands. Nasturtiums require darkness to germinate. Planting too shallowly inhibits germination. Water to moisten the soil to a depth of 3 to 4 inches and keep the soil moist until the seeds germinate in 7 to 14 days. Sow seeds in late spring or early summer, in well-drained soil and a sunny location. Soil should be average to poor nutrient levels, since rich soil will encourage leaves to grow, and will slow the production of flowers. Keep the plants moist. Water the plants weekly, or whenever they are dry. Expect the plants to grow quickly the first few weeks. Large varieties may trail over garden beds or climb fences, while compact varieties may stay within the borders of containers and plant beds. Harvest leaves and flowers during summer for use in salads, tinctures, or infusions. Eaten fresh, the leaves and flowers add a spicy, peppery flavor to salads. They can also be used for spice in cream cheese, dips, or egg dishes. Brightly colored flowers may be used to decorate cakes or pastries. Use the plants for herbal remedies, too. Traditionally, garden nasturtiums have been used internally to treat respiratory infections, since it is known as an expectorant and antibiotic. It has been used to treat scurvy and minor injuries. Nasturtiums also contain large amounts of sulfur, which is thought to slow down baldness.